Do you remember how many breads have you eaten in your life? I have tranceded humanity JOJO! 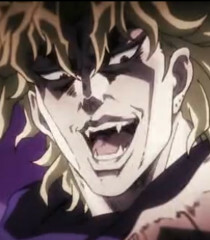 Do you think you can beat the GREAT DIO!! YOU'RE A WEAKLING YOU'LL DIE, DIE, DIE, DIE!! Take that! Theres going to be no more fun for you Captain N! Stay out of this Jojo!!! I am the cause for all youre pain and suffering! Me Dio Brando!! !